Creative Director Elena Kiam and Red Carpet Collection Designer Dani Stahl invited OJ&B to preview lia sophia’s latest jewelry selections for Fall/Winter 2011 last week at the Empire Hotel. The jewlery line, which is a big celeb favorite, debuted the boudika Red Carpet Collection to the fashion elite during Mercedes-Benz Fashion Week. I was so excited to check out what lia sophia had to offer for Fall/Winter 2011. The jewelry for lia sophia is normally for women but I always look at pieces to see if I could pull them off without looking crazy. 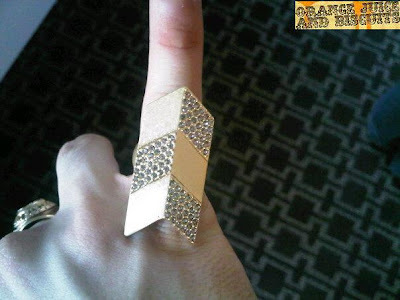 I LOVE a good ring and I absolutely fell in love with this arrow ring that I knew any girl or guy could rock! I put it on an instantly knew i had to rock it! Above: I picked out this lia sophia arrow ring made with black diamond crystals and matte gold. It makes me feel like a rockstar! The best part about going to the lia sophia lounge was running into the host of E! News and E! 's Fashion Police, Giuliana Rancic (see opening photo)! She is like entertainment news royalty and you know that celebs and fashion are my favorite thing! It was such an honor to meet her and we of course hit it off instantly. She even asked my about OJ&B so now Guiliana Rancic-DePandi (as I like to call her) knows about OJ&B! I hope that she reads it in her office at E! with Ryan Seacrest. Thanks for being so nice to me GRD. Next time you are back in NYC you totally need to holla at me and we will go have a coffee and talk celebs and fashion slash let me know if you need an extra person on E! 's Fashion Police (my dream)! *Photo Credit: All photos that do not have the OJ&B logo were taken by Lara Eurdolian of PrettyConnected.com.